Efforts are also underway in Iowa to expand access to Medication Assisted Treatment (MAT). 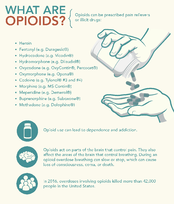 Suboxone is used to treat adults who are dependent on opioids. It helps to relieve withdrawal symptoms and decrease cravings. Medication, combined with behavioral counseling, offers a “whole patient” approach to deal with dependency on opioids. Grant funds allowed Prelude to co-host a training session featuring Dr. David Mee Lee, a leading national expert in MAT services, who shared information with local health care professionals to use in their practices. Prelude is currently training staff and preparing to become a MAT provider in Iowa. We'll share more information about MAT services in the near future.